Pipe Sizes from 3/8 to 2"
The FP2000 Series is designed to measure the flow of a fluid in a pipe. The meter is factory calibrated to any engineering units and displays the rate of flow, total or both (depending on the model selected) on a 6-digit LCD display. Two “AAA” batteries power the unit for up to one year. There are three models available: FP2000-R is a rate meter designed to measure and display the rate of flow; FP2000-T is a totalizer meter designed to measure and display the total flow; FP2000-RT is a rate/totalizer meter designed to measure and display both the rate of flow and the total flow. Measuring accuracy requires a fully developed turbulent flow profile. Pulsating, swirling and other disruptions in the flow stream will affect accuracy. Flow conditions with a Reynolds Number greater than 4000 will result in a fully developed turbulent flow. A Reynolds Number less than 2000 is laminar flow and may result in inaccurate readings. 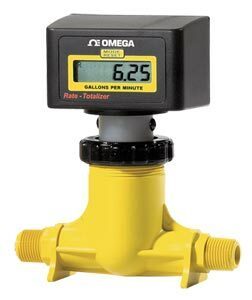 The meter’s accuracy is affected by disturbances such as pumps, elbows, tees, valves, etc., in the flow stream. Install the meter in a straight run of pipe as far as possible from any disturbances. The distance required for accuracy will depend on the type of disturbance. 참고: Comes complete with operator's manual and 2 "AAA" batteries. For units factory programmed in liters, add suffix "-LITERS" to model number, no additional cost. For a 5-point NIST Calibration, add suffix "-NIST" to the model number, add $320 to price.